Please come sober. 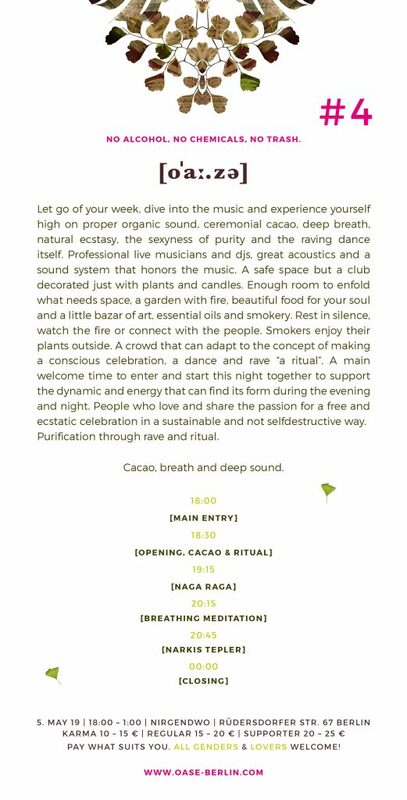 If you want to connect with the raw cacao plant (one of the oldest medicines) it´s suggested to have a light meal before, best you have a good lunch and leave sugar and coffeindrinks for the others… The raw cacao and the breathing meditation (included in the price) will help you to dive deep into the music, to feel yourself and if u are open for that, connect to the others around you. There will be amazing vegan food prepared with lots of love by the “Freiraum der Einheit” Crew and you can buy alcfree drinks in the “Nirgendwo” Bar. 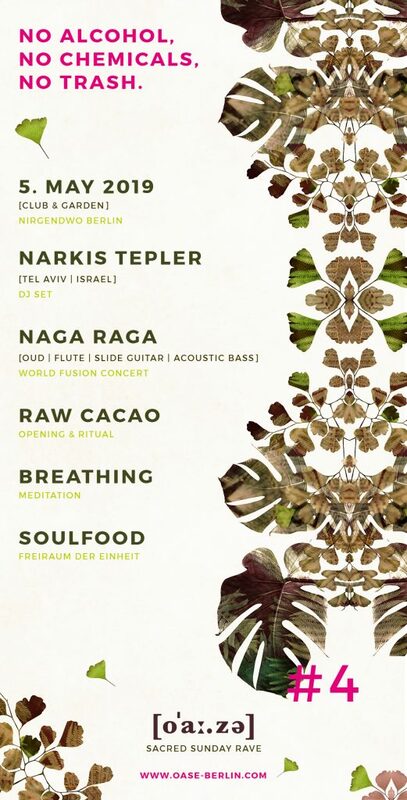 We will start with an opening cacao circle held by Liv and dive into a world fusion concert by Naga Raga. After Liv will lead you into a peaceful breathing meditation. Narkis Tepler will softly wake us up with her three hours piece of deep music, to set us free to dance. NO racism, sexism, ableism, ageism and any other form of discrimination is tolerated at [oˈaː.zə]. You are invited to act free and respectful, in any case of discrimination you can come over to the [oˈaː.zə] team for help and support. All genders & lovers welcome! U can dance your prayer, your name, your animal. The events during the summer will be in our homebase at nirgendwo berlin.